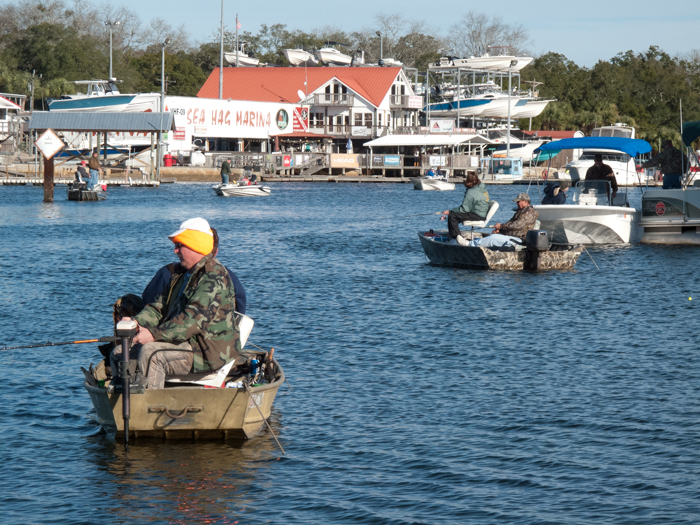 A typical winter day near Steinhatchee’s Sea Hag Marina! 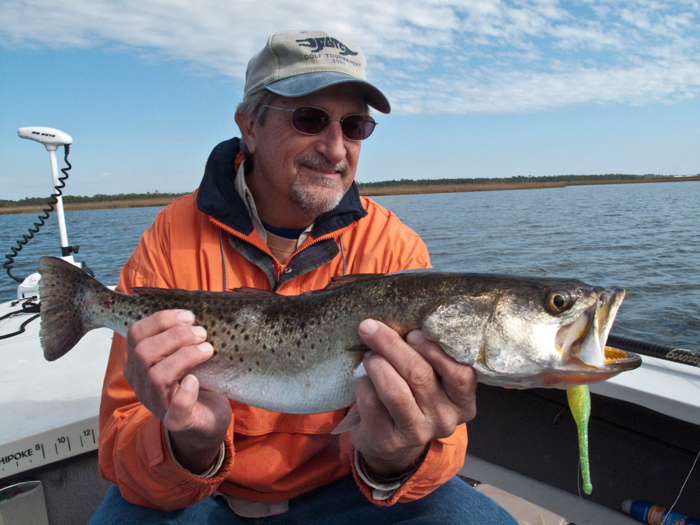 Everyone wants a limit of spotted seatrout! Cool air temperatures that follow the arrival of cold fronts to Natural North Florida’s west coast usually drop Gulf and river water temperatures down a degree or two. Feeling that drop, and the likely onset of winter, spotted seatrout head for deep holes in rivers, creeks and channels and become lethargic in the cold water. 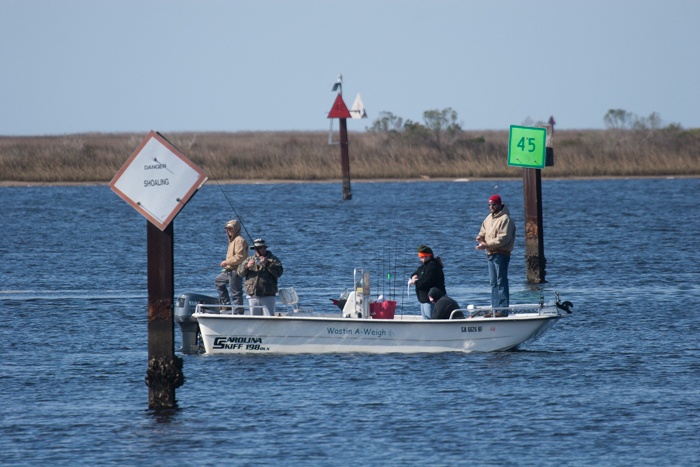 But they still have to eat, and when they’re bunched up in places like the Steinhatchee River (near marker #26 or just downstream from the Sea Hag Marina) or the holes in Barnett, Dan May or Dallus Creeks, things can get busy! Dan May and Barnett creeks are located just south of the mouth of the Suwannee River’s East Pass and Dallus Creek is located just about halfway between Steinhatchee and Keaton Beach, in Taylor County. You can check your depthfinder for signs of a rocky bottom…or just lose some tackle to prove the point. Slow-moving baits, fished deep will produce the best results. Leave your corks at home for this type of fishing! 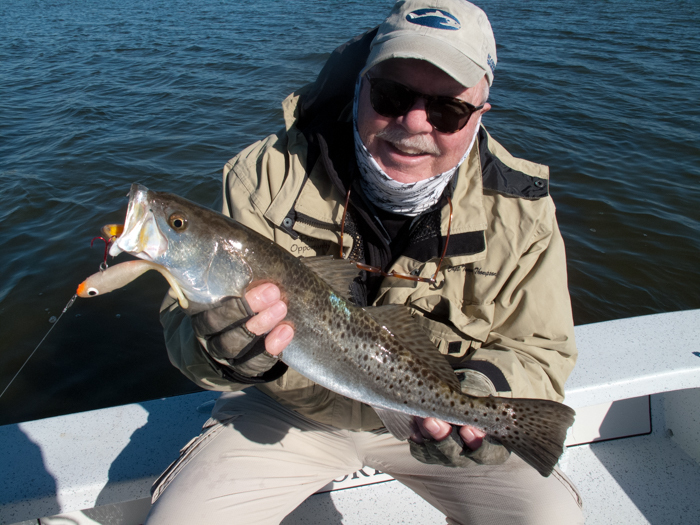 While most trout caught during winter in deep channels and holes are just above the 15-inch legal slot, some are over the 20-inch trophy mark. This one was caught on a locally favorite lure–the Paul Brown Devil, fished “low and slow”. MirrOlure’s TT Series of lures also work well. 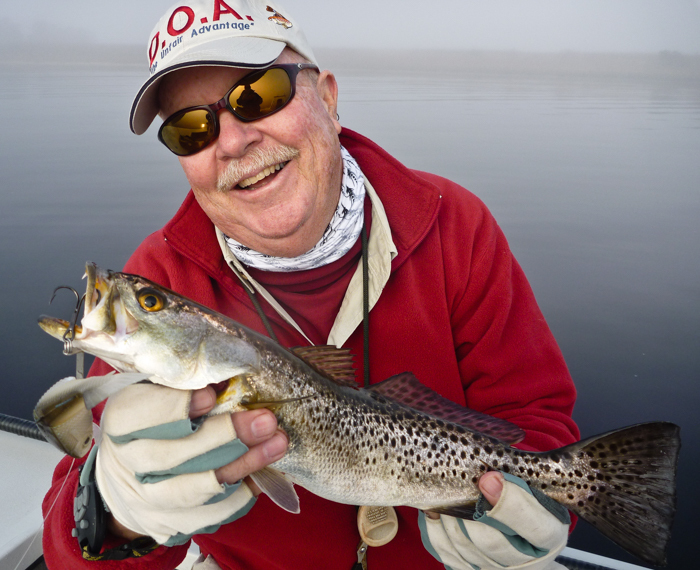 Soft lures and plugs, like D.O.A.’s BFL Mullet and CAL jigs and tails also work well when fishing for wintertime trout. Fish and fishermen both need to stay warm when it’s cold. But in Natural North Florida, cold winter days warm up quickly! Another option, especially if the boats are too close to each other and lines are getting tangled*, is to head to rocky points and rock piles that are right against the Gulf shoreline. There, especially on sunny days when it’s cold in the morning and the tide is low, that the rocks will warm quickly in the sunshine and then get covered by the rising tide. That combination of events will bring bait fish like mullet to the warm rocks–soon to be followed by big trout and reds! *Be courteous, as crowds are likely to be found over and near popular fishing spots. Avoid casting over other anglers’ lines and anchor ropes, and if you get tangled, handle the situation in a “gentlemanly” manner.